DWF has grown considerably from its beginnings in Liverpool in the mid-1970’s into a national law firm, with 12 offices and over 2,500 employees. DWF is a values-driven law firm and we care about making a demonstrable difference to our people, our clients, our communities and our environment. 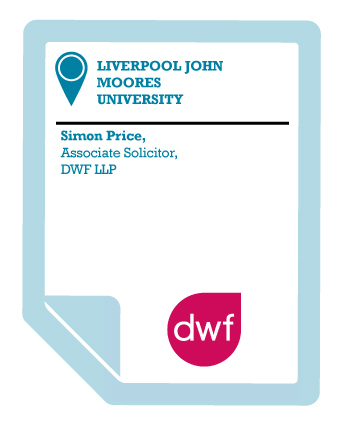 DWF has a long association with Liverpool John Moores University (LJMU) and we share its commitment to our local communities. This has led to collaborative projects with the University seeking to help their students understand what it takes to be successful in their careers. For example, I have delivered a workshop at LJMU for 3-4 years now called the ‘Modern Lawyer’ which looks at how students can enhance their skills beyond the purely technical; how they can adopt a holistic approach to being successful in addition to developing the technical skills of being a lawyer. I’ve probably delivered the ‘Modern Lawyer’ to over 1000 students over the last few years. And it is now embedded in the University’s induction programme, so every LJMU law student at the University now gets a chance to attend the Modern Lawyer and gain an insight into what it’s like to work as a lawyer. Liverpool John Moores University has been very proactive in seeking to help their students prepare for work. Their World of Work (WoW) certificate has been instrumental in demonstrating that employability is about much more than just getting a degree. I believe the University is helping its students understand their strengths and weaknesses, how to manage projects, manage their time and develop key employability skills. I am a big advocate of the importance that non-technical employability skills play in preparing the next generation for the world of work and that is why I am happy to support LJMU students.